Hand crafted: All of our professionally hand-crafted, kiln-dried stretcher bars are made to the highest specifications. 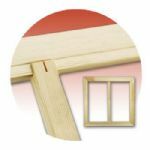 The finger jointed timber fits together like fine furniture for the tightest possible fit, using traditional mortised corner joints for ease of assembly. 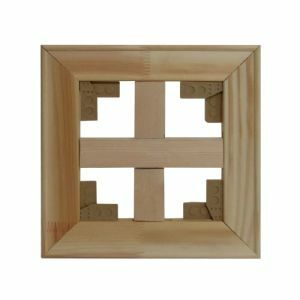 Special attention is also given to corner joints to guarantee that all of our stretcher bars fit neatly together and lie flat against the wall. Available Sizes: Available in 1 inch increments, ranging in lengths from 8 inches (203mm) up to 71 inches (1803mm). Please contact us for stretcher bars longer than 71 inches. All the sizes are interchangeable, so you could make a 6” x 60” or 40” x 30” or any size combination your wish. 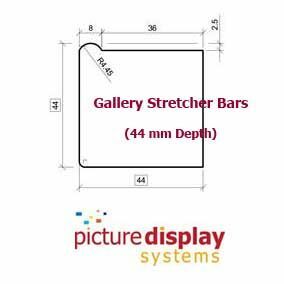 For larger frame sizes, say greater than 40" (100cm), there is a possibility the Standard (thinnest) bars will bow over time (depending on room conditions), so we recommend using Premium or Gallery stretcher bars for larger frames. 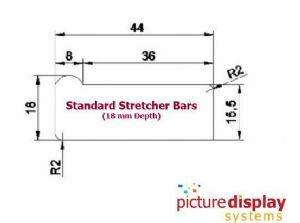 Made to Measure: Made to measure stretcher bars can be produced to nearest mm, up to a maximum size of 1803mm. For pricing, use next nearest inch equivalent (round upwards). Corner Wedges: Stretched canvases can lose tension over time, for example due to changes in room temperature. 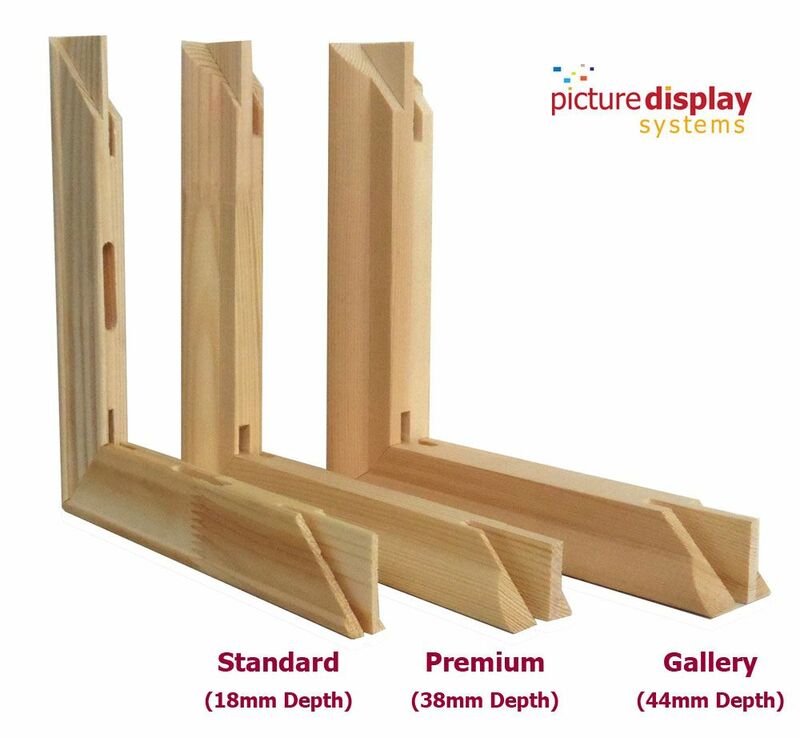 The slotted corner joints allow you tap in the corner wedges (supplied with each pair of stretcher bars), into the corners of the frame, opening it up very slightly and re-tensioning the canvas again (so it is tight like a drum). 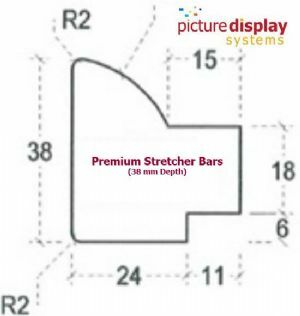 Pricing: The prices shown on our website are for a pair of stretcher bars, including corner wedges. For example, to produce one canvas frame sized 14” by 20”, you need to order one pair of 14” stretcher bars and one pair of 20” stretcher bars. Each pair comes with 2 corner wedges. 15% over £1000 (inc VAT). These discounts can apply to a mixture of different stretcher bar sizes and types (i.e. they don't have to be all the same type or size of stretcher bars). Please note volume discounts are not automatically set-up when ordering directly on our website. To receive these discounts, place your order on our website using the Purchase Order option, and one of our team will contact you with a discounted quote - for payment by card over the phone or via BACS transfer. Returns policy: All stretcher bars and cross braces are made to order, so we can NOT offer any exchanges or refunds (where stretcher bars have been supplied and made correctly). Lead time: It takes about 1-2 weeks from payment for your stretcher bars to be ready.